Chantilly Virginia is a hot spot for casual dining and comfort food in Fairfax county, with a wide selection of cozy restaurants and down home cooking spots sure to delight anyone who enjoys hearty portions and simple dishes. You’re spoiled for choice when it comes to the most important meal of the day: Breakfast. Lee Road Deli, though famous for their deep fried cheesesteak eggrolls and deli sandwiches, serves generous portions from a no-frills breakfast menu every weekday morning from 7 to 11 and on Saturday’s from 9-11. 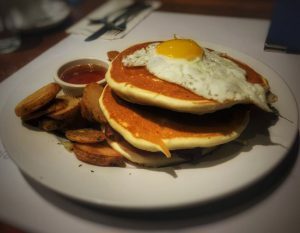 If you prefer to be overwhelmed by choice when it comes to breakfast, visit Eggspectation, a Canadian chain restaurant with a huge menu, where you will find something to please everyone, especially pancake and french toast lovers. If you prefer your breakfast to be small and mostly caffeine based, look no further than local gem Cafein, a small cafe with big heart and savory breakfast sandwiches and delicate pastries. This is a great spot to sip a frothy coffee while you read emails or catch up with a friend in the middle of a busy morning. When it comes to places to grab a hot meal to go in Chantilly, there are many local restaurants to please any comfort food craving. The Burger Shack is a diner in the renovated replica of historic McAtee Tavern. A great spot for burgers, hotdogs and milkshakes, they even specialize in vegan and vegetarian burger options. Locals come from miles around to enjoy the fresh, never frozen, made to order burgers, making The Burger Shack a county favorite for take out or family dining. With a slogan of ‘Get In Here And Eat’, Willard’s Real Pit BBQ gets straight to the point. Huge portions and rich hearty barbeque classics are the staple of this restaurant. 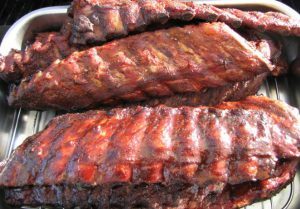 There’s usually a line out the door, but with a separate take out counter and ample seating for dining in, you’ll never have to wait long to dig into sumptuous barbeque. Don’t miss the burnt ends sandwich or beef brisket. This is a great place to pick up food for a crowd, and with such specials as the ‘Feedbag for 4’, ‘Supper for 6’ or ‘Snack Pack for 8’, there are multiple ways to enjoy Willard’s barbeque the best way: getting to taste as many meats and sides as you can, in one sitting, with friends or family. A great place to end the day is at the Mustang Sally Brewing Company, a popular craft brewery and local hangout. With a constantly changing selection of beers on tap in their tasting room, it’s a great place to pick up beer to enjoy at home, or enjoy happy hour with friends. On Friday and Saturday nights there is live music and a rotating selection of food trunks on hand. Between the ever changing selection of beer, music and food at Mustang Sally’s and the large selection of restaurant options in Chantilly, you’ll never run out of things to enjoy. Previous -> Chantilly VA – A Layover at Dulles International Airport.